"We have no way of knowing whether it’s active technology, or a spaceship that is no longer operative and is continuing to float in space." 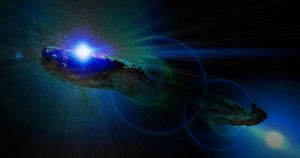 After astronomers first spotted the object later dubbed ‘Oumuamua — a Hawaiian word that means “messenger sent from the distant past to reach out to us” — Loeb and a colleague speculated that a hypothetical propulsion device called a solar sail could explain its odd trajectory. Another odd finding was that the object’s brightness from reflected sunlight changed by a factor of ten as it spun, implying that it could be a cigar- or pancake-shaped object tumbling through space — an extremely unusual geometry for naturally-occurring asteroids. Loeb has embarked on a media blitz recently, giving a separate interview last week in which he predicted the impact on humanity of discovering an extraterrestrial civilization. In the interview with Haaretz, he suggested that the universe could be littered with alien societies and that Earthling scientists should focus on finding evidence of them.